Malala is a teenage Pakistani girl who was shot in the head by the Taliban because she stood up for education rights for girls and women. Miraculously, she survived. She recieved treatment in England, where she now lives with her family. She has gone on to achieve global fame, including being nominated for a Nobel Peace Prize, and continues to speak out for education. Of course I knew all this from the news, and actually didn’t plan to read the book, but I picked it up and next thing I knew, I was in chapter 3…so of course I had to bring the book home. What struck me most about Malala’s story was how she came to be an education advocate in the first place. Her father was a teacher and activist in Pakistan. The school he founded grew large, altho not necessarily prosperous because of all the scholarships he gave away. When the Taliban came to Pakistan and started enforcing Islamic extremism, he lead activist groups and spoke out in the media. He refused to sucumb to pressure and threats, and kept his school open to girls. He treated his daughter Malala like an equal to his sons, which helped develop her freedom and confidence, as well as her love of learning. Malala’s mother played a role that was less obvious but equally important. She was a housewife, not an activist- but its clear that she enjoyed more freedom and influence than many women in her culture. She had a role in family financial descisions and opened her home to many family members in need. Without her support, her husband would not have been as successful. Malala obviously is a person of extraordinary courage, but its clear that she was rooted in a strong loving family. Her love of learning was instilled from both parents all her life. The tone of this book’s writing was very inviting. Malala had a co-author, so I’m not sure how much of the style was hers, but it felt like sitting down and talking to a friend. Malala’s voice came through as direct and uncomplicated. She offered explanation and background for many things that would be unfamiliar to a Western reader, but the story doesn’t slow down. Overall, I found the book somewhat charming. Malala shares little details of her home life and family to paint a vivid picture of her life. She is quick to point out her failings, including her worst subjects in school, her disagreements with friends and fights with her brothers. In the end, the book invites us to see Malala not as an extraordinary person, but as an ordinary person who has had extraordinary experience and opportunity. 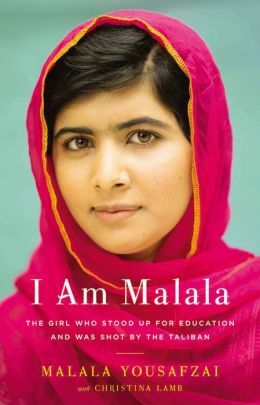 She says she doesn’t want to be known as “Malala the girl who was shot in the head” but as “Malala the girl who stood up for education.” Thanks to the teaaching of her father, the support of her mother, and the story in this book- I think we will all remember Malala that way. You might like: And the Mountains Echoed, K. Hosseini. Kabul Beauty School, D. Rodriguez. This entry was posted in Non-Fiction, Top 10 and tagged biography, book review, education, family, Islam, non-fiction, women. Bookmark the permalink.